A high-tech assassination attempt failed to kill its intended target, the President of Venezuela, Nicolas Maduro. The attack came in the form of a drone rigged with explosives and then detonated near the military event where President Maduro was giving a speech. The Venezuelan government has already pointed its crooked finger at the Colombian president as being responsible for the failed assassination. "This was an attempt to kill me. Today they attempted to assassinate me," Maduro said after the attack. Maduro added that investigations thus far have accused the "far right" of working with Colombians in the neighboring Andean country. Maduro had no issue blaming the attack on Colombian President Juan Manuel Santos right away. It is almost as if the assassination attempt was staged by the Venezuelan government because of how quickly they are condemning Columbia and the so-called far right. Police have arrested individuals in connection with the assassination attempt but details about who they are or their connection to the crime have not been revealed. Colombian officials have not yet responded to the Venezuelan president's accusations. An unknown group has allegedly taken responsibility for the attack. Soldiers in T-shirts claimed on Twitter they planned to fly two drones with explosive payloads at the president but they were shot down by government soldiers before reaching Maduro. Firefighters are disputing the official narrative from the government saying it was actually a gas tank explosion inside an apartment. Smoke could be seen billowing from an apartment window and scorched carbon covered the building's walls. Venezuela is currently led by far left ideology and four years ago outlawed guns. Within a year or two after that things took a turn for the worse and now the country has been crippled economically and is in a humanitarian crisis with food and work virtually no longer existent. 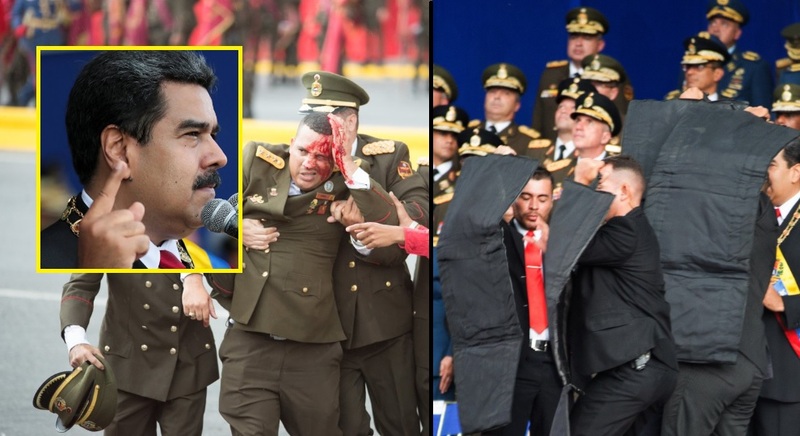 One more thing, why does Maduro not even flinch during the so-called assassination attempt? He is so calm it is as if he knew it was coming and was not a real threat. He was a bus driver his whole life after all, not a special ops soldier. i thought about this assassination method decades ago. they botched it though.